Account Services is designed with the client's account features in mind. Clients can set up their eBill management preferences, transfer money between internal accounts, view Cash Management awards, update address information, create account nicknames and edit eDelivery preferences. Close-up of Account Services sub-navigation. | Click image to enlarge. 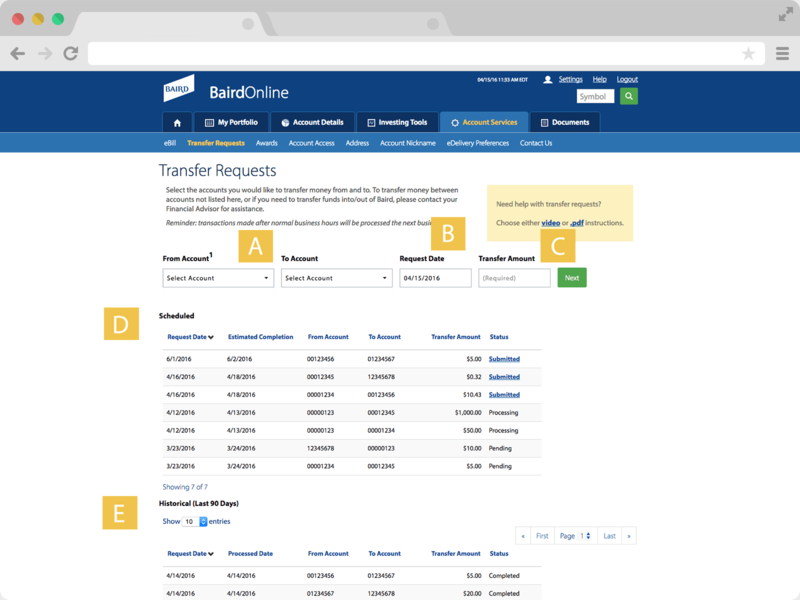 You will find our eBill management site allows you to electronically and securely set up payees and schedule payments of bills. Within the eBill management page there are tools to process one time or recurring payments, you can also view transaction history, payment reporting, view spending pie charts and access other helpful resources. 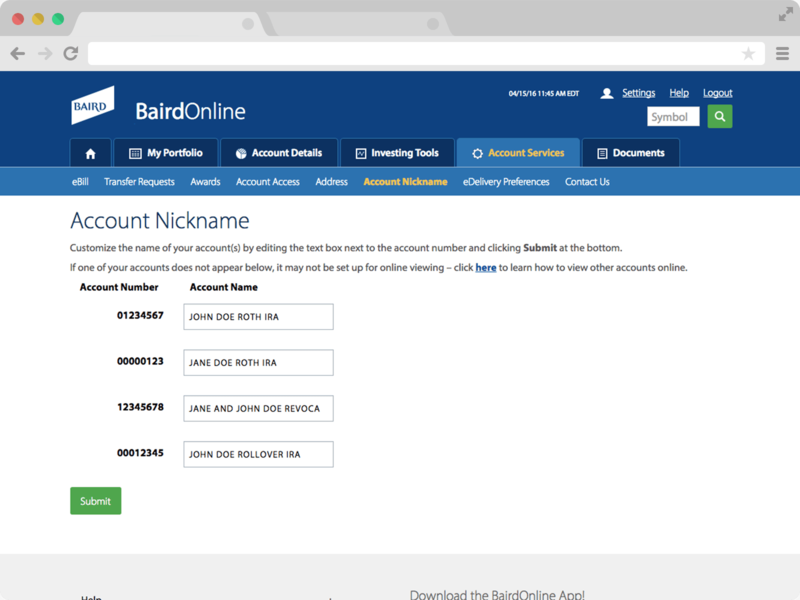 Baird offers clients the ability to transfer money between internal accounts on Baird Online. 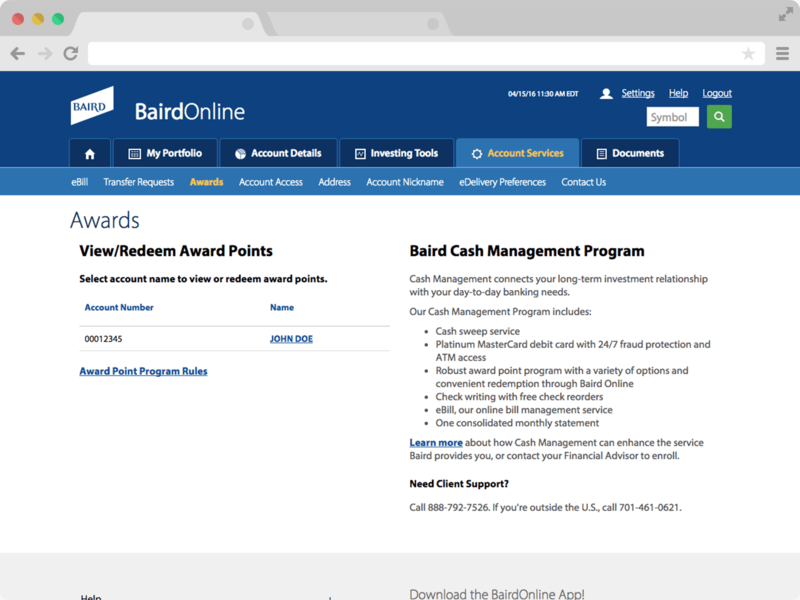 Baird offers a full-service Cash Management program to allow the integration of client investment and banking needs. The Cash Management Program boasts a robust award point program with online award point redemption. For more information on the Awards program, please contact your Baird Financial Advisor. 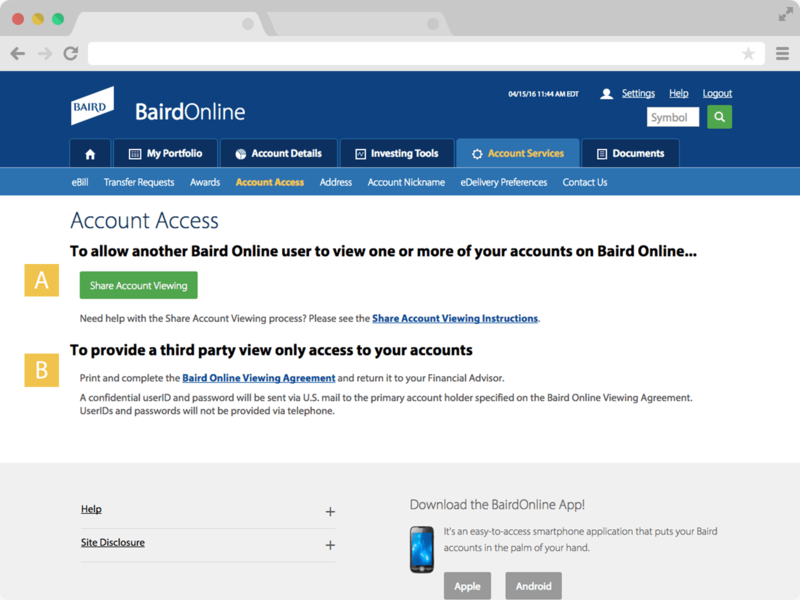 Clients can authorize access to their online accounts to other Baird Online login’s. 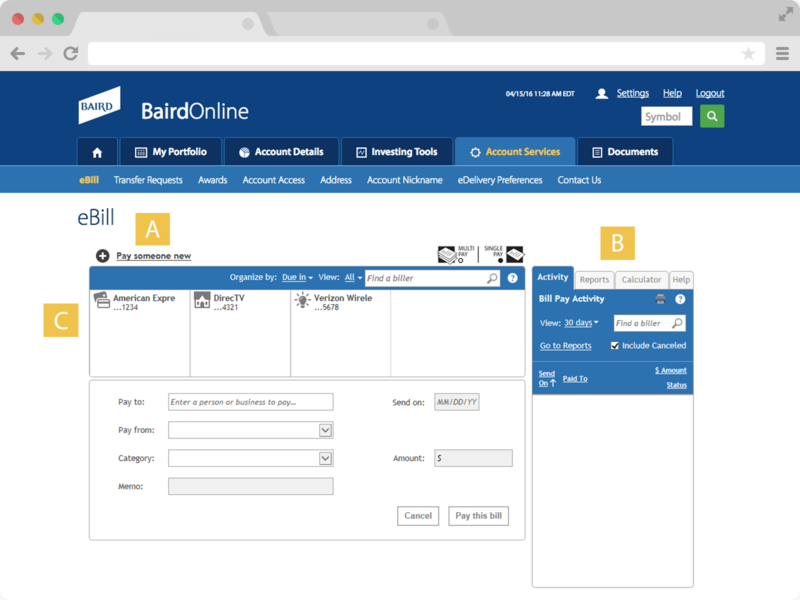 BTo provide a third party access to your accounts, print and complete the Baird Online viewing agreement. 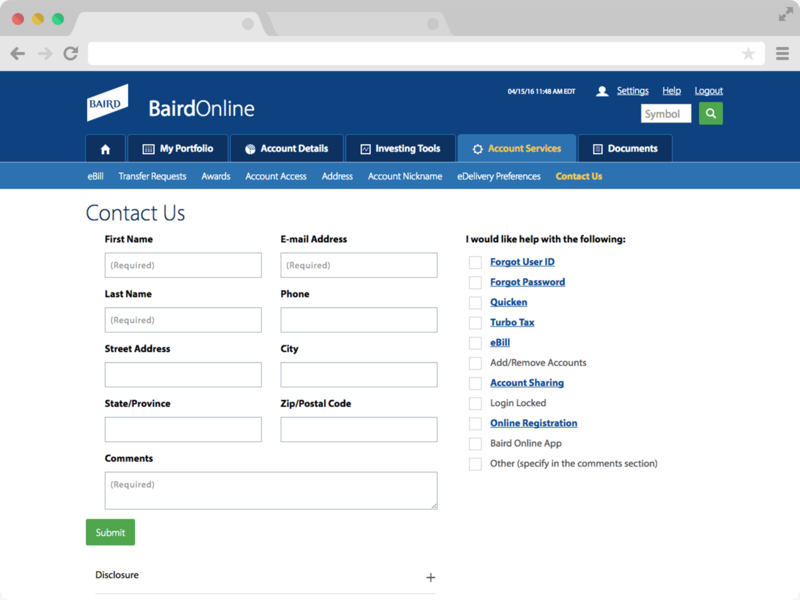 Update your permanent or temporary mailing address directly from your Baird Online login. AEdit your mailing address for one or all of your accounts. BView the last date a change request was made to your address. Provide a more meaningful name to your accounts, instead of Jon & Jane Doe Rev Trust registration. You can name your accounts "Trust Acct", "Kids College", "Retirement", etc. These "nicknames" will only be associated with your Baird Online login. 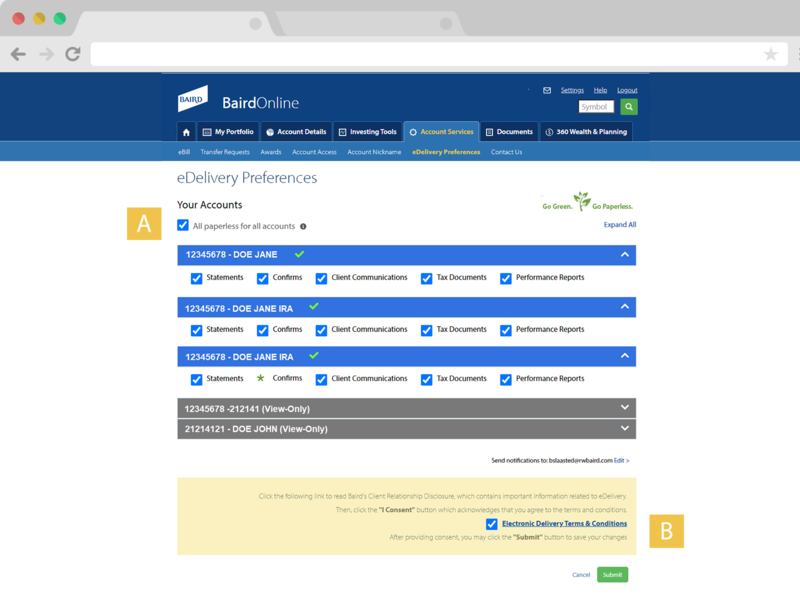 Adjust your eDelivery preferences for statements, confirms and client communications. 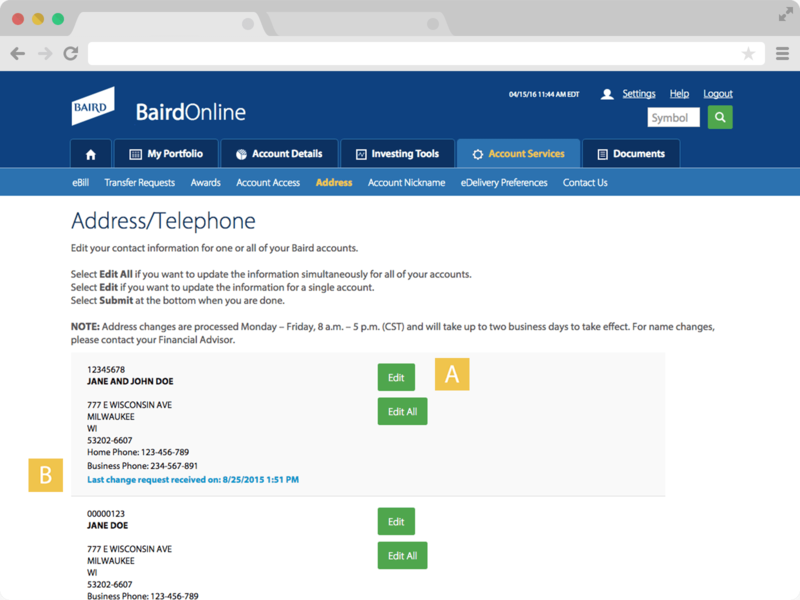 We are happy to accept your request or call with questions on your Baird Online account. Complete the form, or give our Baird Online Technical Support Team a call at 888-212-8843, Monday – Friday from 7am – 6pm CT.